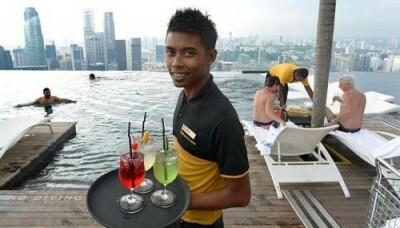 MARINA Bay Sands (MBS) poolside bar captain Muhamad Fazly remembers being overwhelmed with nervousness on his first day at work. The 23-year-old started in December 2010 as a bartender - just nine months after the integrated resort opened in April. "Everyone was talking about MBS. I was excited, but also nervous," said the N-level holder. "I was worried I wouldn't be able to meet the high service standards required." To get ahead, he spent several nights memorising 12 cocktail recipes - all signature MBS concoctions. He soon mastered the art of bartending, but still found it difficult to interact with guests. "I was just so nervous I didn't know what to say to them," he said. He recalled a tense moment when a Japanese tourist asked for a juice. He could not make out what the customer wanted and served him a beer instead. Things improved after training. The first module he took under the Workforce Skills Qualifications (WSQ) system - a basic food and beverage course - threw him into the deep end. "The trainers made us role-play and we even learnt how guests from different countries pronounced words," he said. Lessons he learnt ranged from subtle ones like making sure to serve with his right hand, to more salient ones like checking the expiry dates on drinks and garnish. But more importantly, the training broke down the wall between him and the people he served. He was promoted to bar captain in January this year and, together with two other captains, manages 30 staff members. The second of four children is now aiming to be promoted to assistant manager. He is loyal to MBS because he is treated well. "They send us for training and invest in us. When it gets too sunny, they give us sunblock and caps."